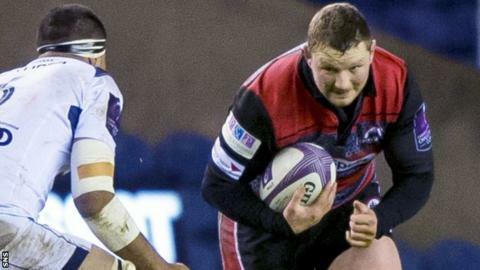 Edinburgh's prop John Andress will move to Munster on a one-year deal at the end of this season. Tight-head Andress, 32, came up through the youth ranks with his native Ulster before signing for Exeter in 2007. After spells at Harlequins and Worcester, Andress, who has played for Ireland A, signed a two-year deal with Edinburgh in May 2014. Andress, who has made 48 appearances for Edinburgh, says he has enjoyed his time with the club "immensely". "Being on 48 caps, it would be great to leave having achieved my 50th cap and be able to mark my time here in such a special way," he said. Edinburgh head coach Alan Solomons paid tribute to Andress' efforts with the club. "John is an experienced scrummaging tight-head who has made a valuable contribution to the club over the past two seasons," said Solomons. "He is a good bloke, an excellent team man and a pleasure to coach. We wish him every success in his new venture." Munster have also announced that lock Darren O'Shea will return to the club at the end of this season after two years with Worcester. The Irish province will be without Australian international forward Mark Chisholm for the remainder of this season after he sustained concussion in the game against the Dragons earlier this month.